An important city founder, developer, and urban promoter, Charles Gasham "Gristmill" Jones worked tirelessly to make Oklahoma City the most important metropolis in Oklahoma Territory. He was born in Greenup, Illinois, on November 3, 1856. Shortly after arriving in late 1889, Jones organized the construction of a canal to bring electrical power to downtown Oklahoma City. That project coincided with the construction of his flour mill, the first in Oklahoma Territory, which earned Jones the nickname "gristmill." His most important contribution to Oklahoma City involved railroad construction. In 1895 Jones and financial backer Henry Overholser organized the St. Louis and Oklahoma City Railroad Company and in 1898 constructed a line from Sapulpa to Oklahoma City. The line became a key transportation network that spawned significant population increases and made Oklahoma City a viable candidate for state capital. Many of the smaller communities around Oklahoma City, such as Jones, Luther, and Mustang, owe their existence to Jones, who platted them and sold the land for a profit. Guided by his passion for farming, Jones helped build, fund, and promote the Oklahoma Territorial Fair and the State Fair of Oklahoma as a means to showcase state agricultural products. A staunch Republican, he remained politically astute and eager to serve. 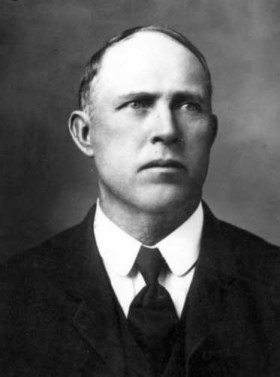 He was elected to the First, Fifth, and Sixth Oklahoma Territorial Legislatures, served as mayor of Oklahoma City in 1896–97 and 1901–03, represented Oklahoma County in the First and Second State Legislature, and had unsuccessful runs for the U.S. Congress in 1908 and for governor in 1910. Married twice and the father of one son, Luther, Charles Jones died of a stomach hemorrhage on March 29, 1911. In 2001 Jones's farmstead in Jones, Oklahoma, was listed in the National Register of Historic Places (NR 01000658). Aaron Bachhofer, "Forgotten Founder: Charles G. 'Gristmill' Jones and the Growth of Oklahoma City, 1889–1911," The Chronicles of Oklahoma 80 (Spring 2002). Daily Oklahoman (Oklahoma City), 30 March 1911. W. F. Kerr, Story of Oklahoma City, Oklahoma: "The Biggest Little City in the World," 3 vols. (Chicago: S. J. Clarke Co., 1922). "Pen Picture of Charles Gasham Jones," Sturm's Magazine 12 (May 1911). Aaron Bachhofer II, "Jones, Charles Gasham," The Encyclopedia of Oklahoma History and Culture, https://www.okhistory.org/publications/enc/entry.php?entry=JO018.